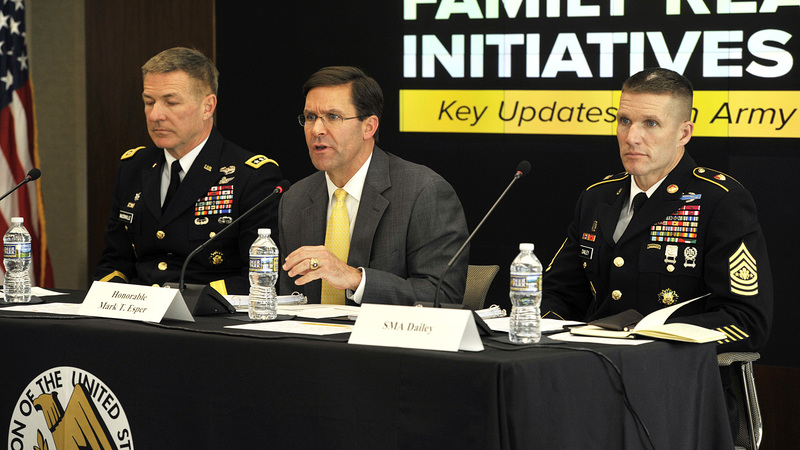 Senior Army leaders, who for years have used the Association of the U.S. Army’s annual meeting as a place to hear complaints about family programs, came to AUSA again in February to announce steps they’re taking to address those problems. At a livestreamed Family Readiness Initiatives Forum at AUSA’s national headquarters in Arlington, Va., Army leaders discussed new projects on housing, moving, spouse employment and child care aimed at improving quality of life for soldiers and their families, and they promised much more to come. Army Secretary Mark T. Esper, Vice Chief of Staff Gen. James C. McConville and Sgt. Maj. of the Army Daniel A. Dailey said they’ve done a lot to start addressing major complaints from soldiers and spouses and are ready to hear more ideas. Housing is a major initiative, he said. Inspections of older homes are underway, with plans to close the worst housing by 2026. Lead paint inspections are being done on pre-1978 homes, while inspectors are also looking for asbestos, he said. To reduce some of the turmoil of change-of-station moves, the Army plans to double the number of quality assurance inspections of household goods shipments and have more shipments done in crates rather than moved piece by piece to cut down on theft and damage. The customer satisfaction scores of moving companies used by the Army will also be posted online, and in May, the U.S. Transportation Command will stand up a 24/7 hotline for anyone in the Department of Defense to call and get assistance with moving issues. Additionally, the hiring process for child care workers and other civilian jobs is being streamlined. Esper said that when he started as Army Secretary last year, it took an average of 134 days to hire a civilian. That number has decreased by about 10 percent, he said, and the eventual goal is to reduce the hiring period to 60 days. This will expand day care staffing, a move that both adds capability and aids military spouses looking for work, he said. Esper added that talks with the Office of the Secretary of Defense have led to other opportunities. “We will soon be receiving new authority for direct hiring, which allows us to hire folks in certain specialties in a matter of weeks, and soon we will see a new policy come on called PPP, which is preferred hiring, that will give us another tool,” Esper said. The Army will also use conditional hiring for spouses who appear to meet the requirements, so they can start work while their formal hiring is being processed, he said. 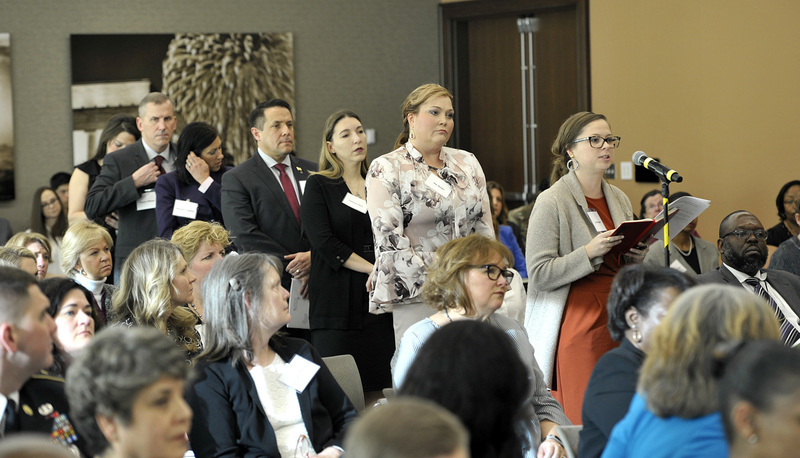 Efforts also continue to assist spouses who require state licensing for their profession, with a policy under discussion that would reimburse the cost of transferring licenses from another state. In response to an online question from a military spouse in Fort Rucker, Ala., regarding spouse employment, Dailey said that spouses should look to the Transition Assistance Center on their installation. “I have visited every [transition center] in the Army, and while those resources are primarily for soldiers, every single one said they would never turn a family member away,” he said. Today, 53 percent of soldiers are married, McConville said, and 43 percent have children. “This has been a great opportunity, and we want to do it again in the future,” Esper concluded, thanking AUSA for hosting the event. Patty Barron, director of Family Readiness at AUSA, said, “We were honored to host the Army senior leaders at AUSA headquarters. It is what we do best. By bringing the voices of our Army families to the decision makers, we ensure their issues are spotlighted at the highest levels in the Army.